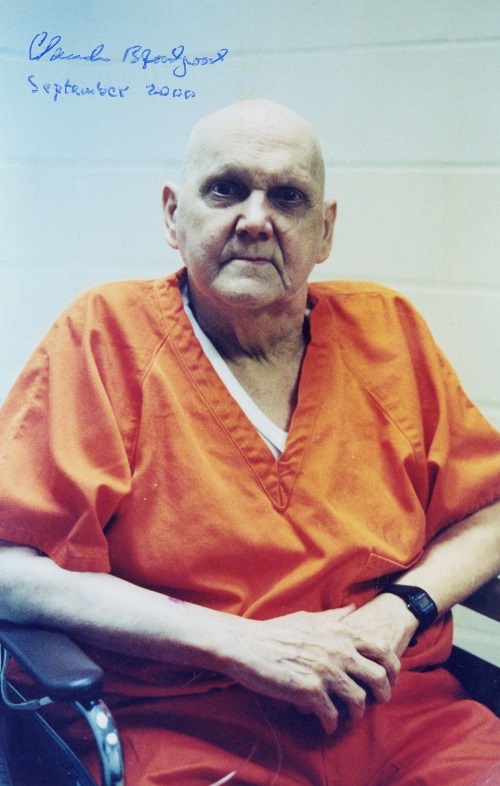 Regarding Arthur Rider, see C.N. 9107. 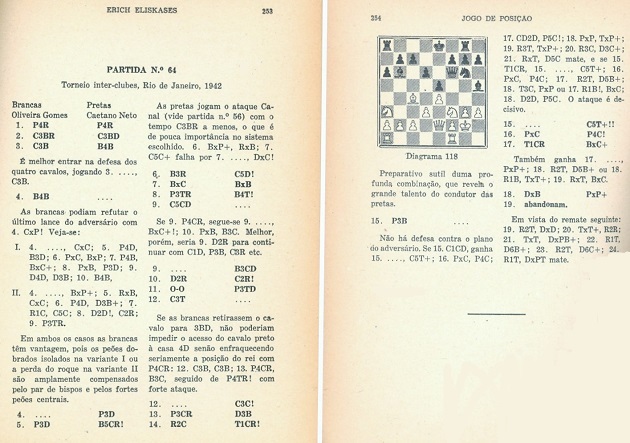 ‘Much has been made of Bobby Fischer’s “red book”. Dr Wildhagen published his red books on various players, and I possessed several. 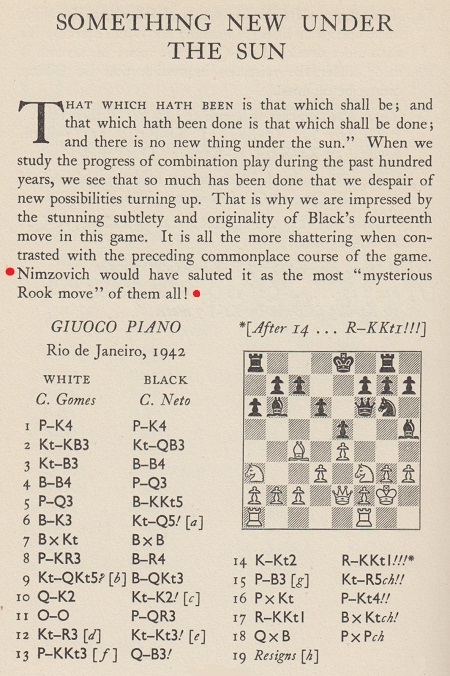 The advantage was that each game contained a diagram after every five moves, and you did not have to use a chess board and pieces to “read” it. 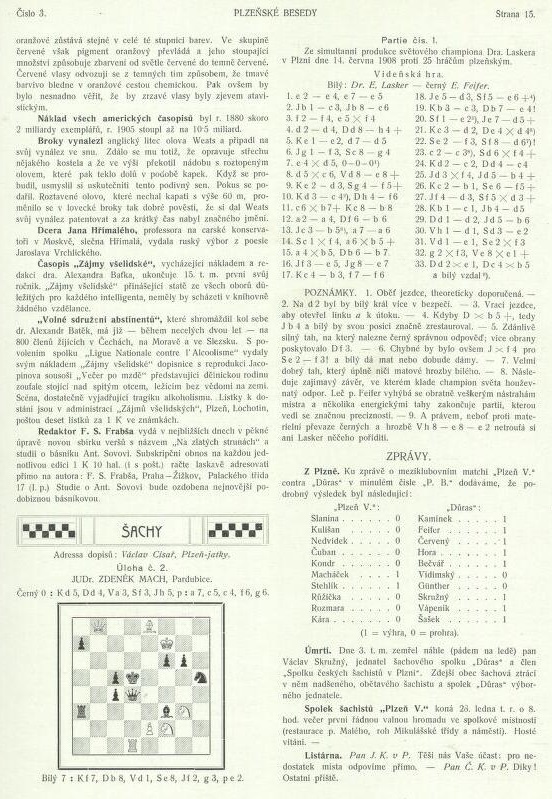 The Spassky volume came out in 1972 before the match in Reykjavik, but it contained only 353 games played by Spassky, up to 1967. It was not complete. 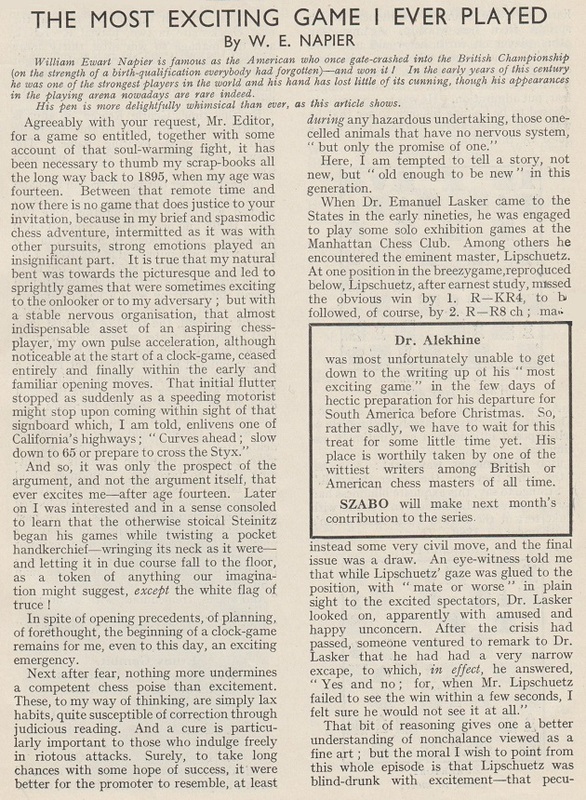 I did not see the book in Fischer’s room in Reykjavik when we analyzed adjourned games, but I was not looking for it. Nor did I see Bob Wade’s work, although I was quite familiar with it. I asked Wade to prepare a dossier on my opponents in the 1976 Manila Interzonal. 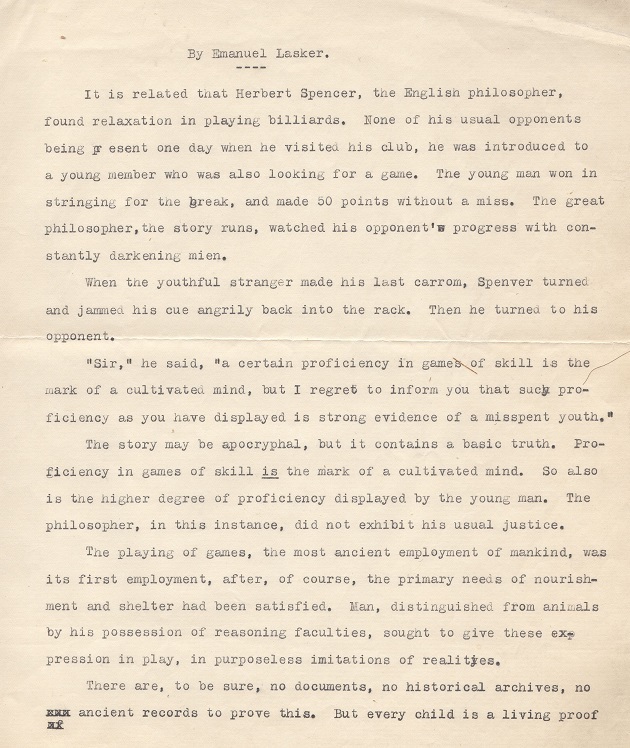 He used index cards handwritten by young English players who also assisted him in publishing the Batsford opening series. 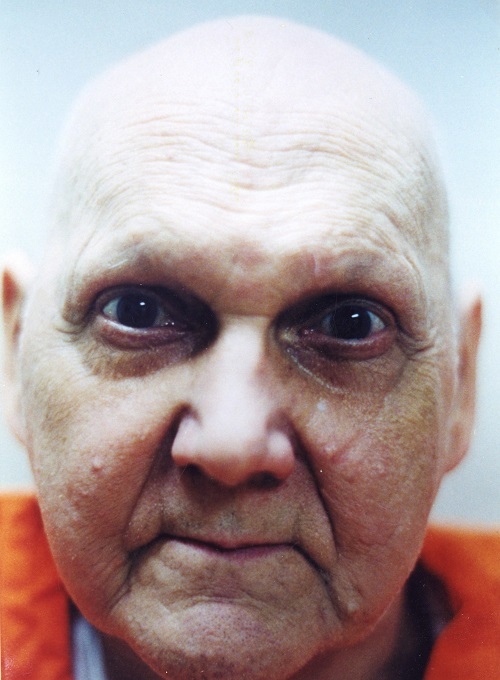 He charged 50 US cents per game. The index cards were handy because you could arrange them according to dates, openings, etc. 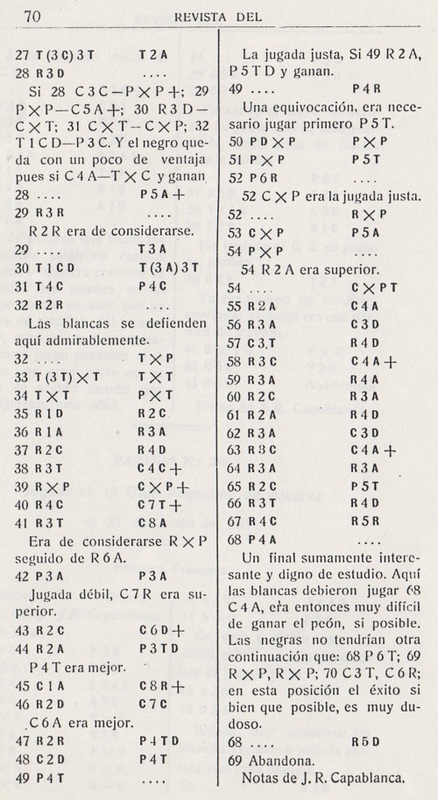 I had been using this system since 1958 while assisting Ludĕk Pachman with his series Theory of Modern Chess (Theorie moderního šachu in Czech). 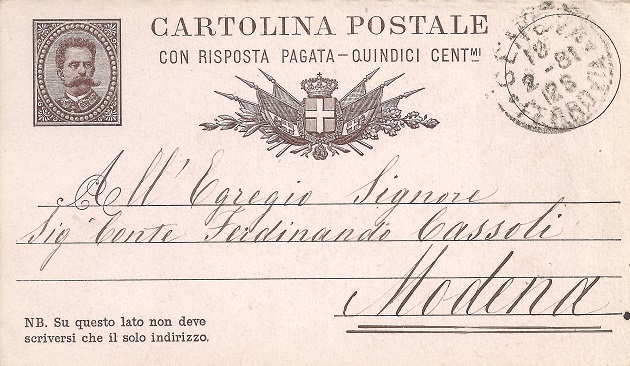 ‘I recently acquired several chess-related postcards addressed to Ferdinando Cassoli Lorenzotti, the strongest player in Modena after the departure of Discart and Bonetti from the city. 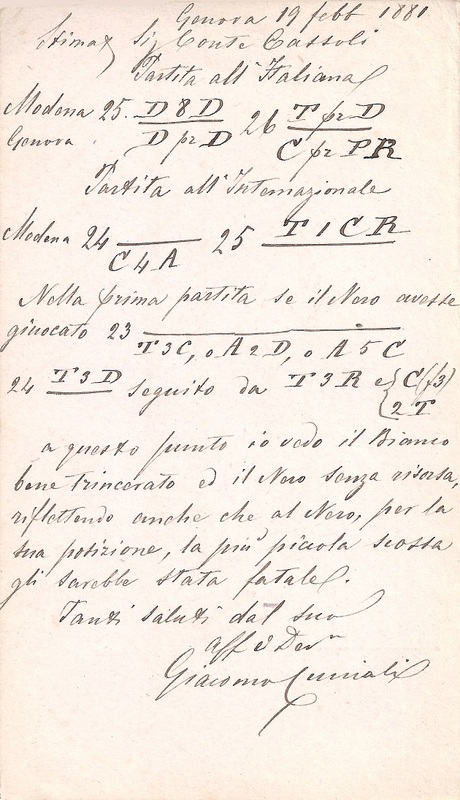 Some of the cards contain moves in two still-unknown correspondence games between Modena and Genova played in the winter of 1880-81. 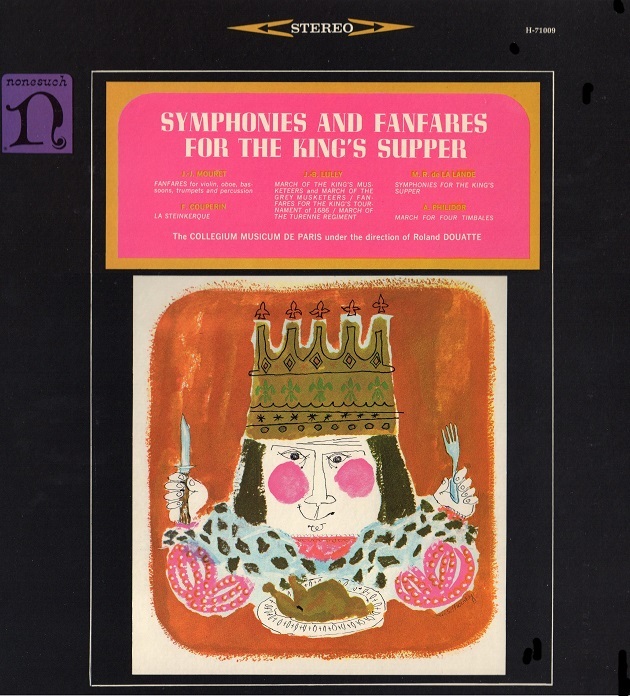 1 ... 2 ... 3 ... 4 ... 5 ... 6 P-Q3 P-KR3 7 P-KR3 B-QN3 8 ... 9 ... 10 ... 11 ... 12 N-KN1 N-KB5 13 ... 14 P-Q4 P-KN4 15 PxP PxP At the moment, it seems to us, a statement about the final outcome of our games should be premature. 16 R-Q1 Q-K2 17 Q-K3 P-KN5 18 P-KR4 P-KN6 Our games are beginning to be interesting and therefore entertaining. 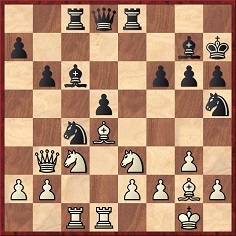 [...] I proposed and endorsed the move 18...NxKP until the last minute, but none of my fellow players approved of it, since they considered it less good than 18...P-N6; I eventually accepted the latter, to respect the majority; moreover, 18...P-N6 promises to be a fine continuation as well. [...] If 18...NxP 19 P-KN3 B-B4 at this stage we tried many lines, but the outcome was always unclear because of their countless variations; rather, after many combinations White stood better. Having time, we could study the position more; but we are all busy from morning until night. 19 PxP N-KN5 In one game the attack is ours, in the other it is yours, but so far the situation is hopeless for neither of us. 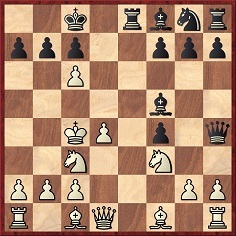 20 Q-K1 N-R4 21 N-KB3 R-KN1 & K-KR1 [Italian castling] 22 QN-Q2 N(N5)-KB3 23 QN-KB1 R-KN5. 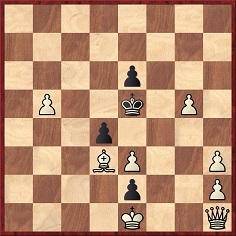 Had Black played 23...R-N3 or 23...B-Q2 or 23...B-N5 [then] 24 R-Q3, followed by R-K3 and N(f3)-R2. Here I see White well entrenched, while Black is helpless, all the more so as Black, owing to his positions, would be lost with the slightest shock. [...] If we played 23...B-Q2 24 R-Q3 R-N3 25 R-K3 QR-KN1 26 N-Q2, I said 26 N-R2, thinking of 23...B-KN5. 24 Q-Q2 K-N2 The game, in my opinion, is decidedly drawn because of the move 24 Q-Q2; but we could avoid it only by jeopardizing the game. 25 Q-Q8 QxQ 26 RxQ NxKP 27 BxP KxB If 27 NxKP+ K-K2. 1 ... 2 ... 3 ... 4 ... 5...N-KB3 6 B-Q3 B-K2 7 Castles ... 8 ... 9 ... 10 ... 11...NxB 12 QxN ... 13...P-QR3 14 N-QN3 N-KN5 15 NxB At the moment, it seems to us, a statement about the final outcome of our games should be premature. 15...QxN 16 P-KN3 Q-K4 17 B-B4 Q-R4 18 P-KR4 Our games are beginning to be interesting and therefore entertaining. 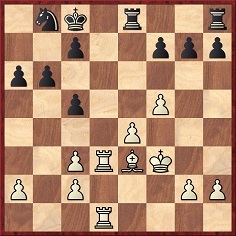 18...B-B4 19 Q-Q2 In one game the attack is ours, in the other it is yours, but so far the situation is hopeless for neither of us. 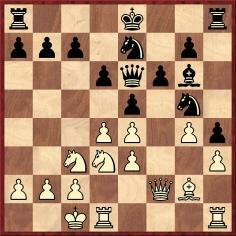 In this game we made a very bad move, which was enough for us to be attacked; it was Nd4-b3. 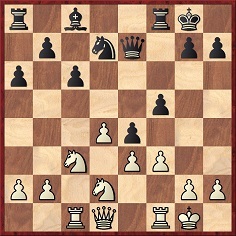 19...N-B3 20 P-KB3 Q-N3 21 R-KB2 KR-K1 22 N-Q4 P-KR4 23 P-QB3 N-Q2 24 K-R2 There is nothing for either party to do, in my opinion, as always happens in the games in which the French and the Sicilian Defences are adopted. 24...N-B4 25 R-KN1 N-K3 26 NxB If 26...QxN 27 B-K3. It would be interesting to reconstruct the full scores of both games. Knowing their openings would be helpful, but they are stated ambiguously. 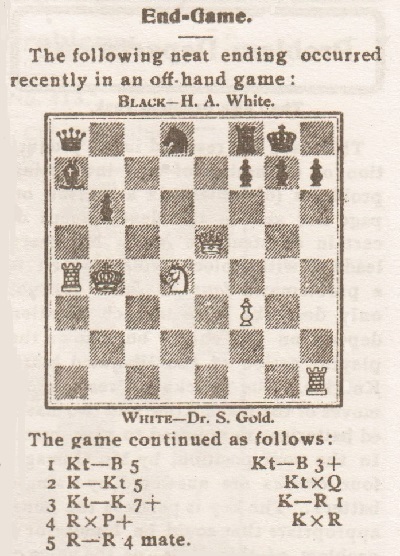 The Modena-Genova contest is called the “Italian Game”, but that may mean either “the opening is an Italian Game” or “the game is played under the Italian rules”; similarly, the Genova-Modena game is often called “French Game”, which may mean either “the opening is a French Game” or “the game is played under the French rules”. In Italy the international rules were called “French” because they were first codified in a book printed in Paris in 1668 and were subsequently sanctioned by Philidor’s treatise. To complicate matters further, on the postcards the Genova-Modena game is once called “English” and once alluded to as “Sicilian”. 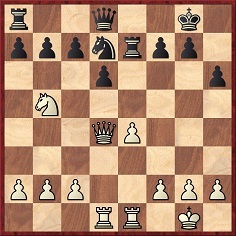 1 e4 e5 2 Nf3 Nc6 3 Bc4 Bc5 4 c3 Nf6 5 Castles (Kh1, Rf1) d6 6 d3 h6 7 h3 Bb6 8 Qe2 Ne7 9 Be3 Ng6 10 Bxb6 axb6 11 Bb3 c6 12 Ng1 Nf4 13 Qf3 b5 14 d4 g5 15 dxe5 dxe5 16 Rd1 Qe7 17 Qe3 g4 18 h4 g3 19 fxg3 Ng4 20 Qe1 Nh5 21 Nf3 Castles (Kh8, Rg8) 22 Nbd2 Ngf6 23 Nf1 Rg4 24 Qd2 Kg7 25 Qd8 Qxd8 26 Rxd8 Nxe4 27 Bxf7 Kxf7 (28 Nxe5+ Ke7). Yes, I have one at all events, and that is that women do not add strength to a chess club, but the exact reverse. 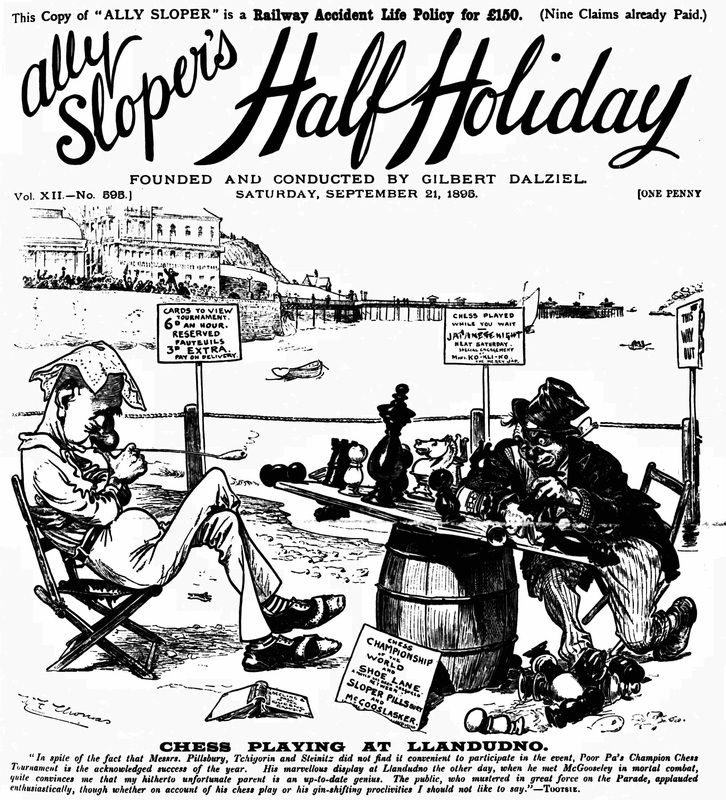 Not only is their chess strength, as a rule, nil, but their characteristics such that chess clubs, even as reading rooms, are always quieter and pleasanter where they are absent. 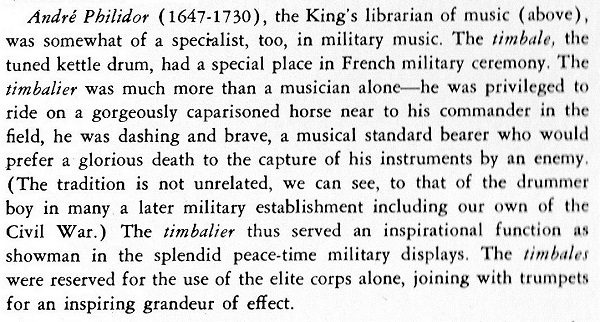 What is the peculiarity of the text below? 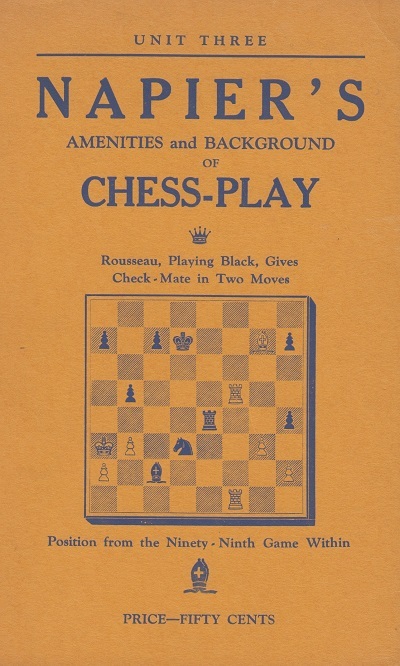 That page, picked at random, is the first of unit three of Amenities and Background of Chess-Play by W.E. Napier (New York, 1935). Napier’s article and the game against Helms were discussed on pages 13 and 339-341 of Napier The Forgotten Chessmaster by John S. Hilbert (Yorklyn, 1997). 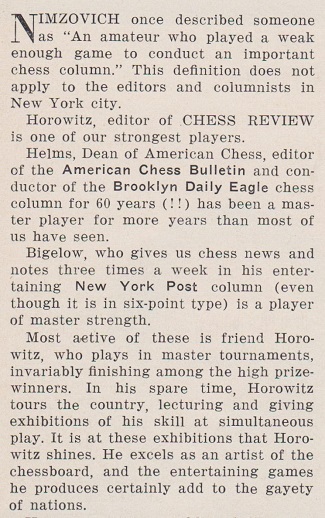 Helms wrote tributes to Napier on pages 86-87 of the September-October 1952 American Chess Bulletin and on page 70 of CHESS, Christmas 1952/January 1953. 1 e4 e6 2 d4 d5 3 Nc3 c5 4 Nf3 cxd4 5 Nxd4 Nf6 6 Bd3 Be7 7 O-O O-O 8 exd5 exd5 9 Be3 Nc6 10 Nce2 Ne5 11 Ng3 Nxd3 12 Qxd3 Bd6 13 Ngf5 a6 14 Nb3 Ng4 15 Nxd6 Qxd6 16 g3 Qe5 17 Bf4 Qh5 18 h4 Bf5 19 Qd2 Nf6 20 f3 Qg6 21 Rf2 Rfe8 22 Nd4 h5 23 c3 Nd7 24 Kh2 Nc5 25 Rg1 Ne6 26 Nxf5 Qxf5 27 Be3. 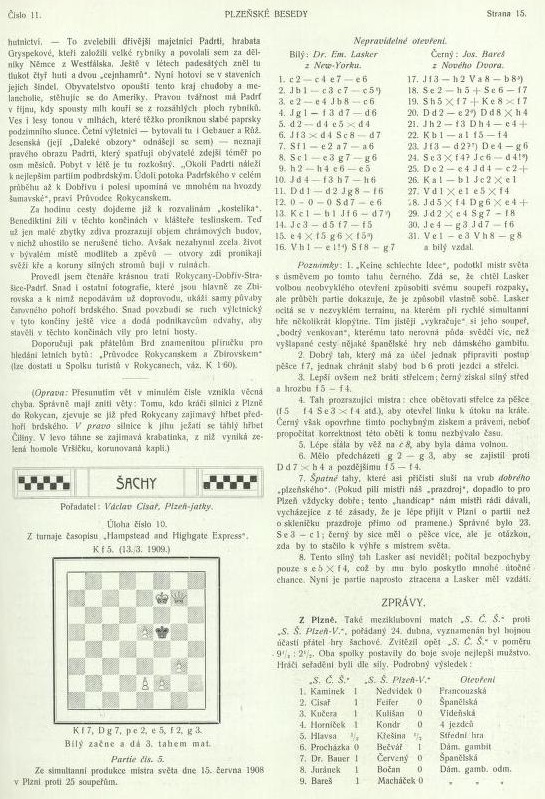 Martino Albonetti (Faenza, Italy) points out an article by Primo Levi on the 1981 world championship match in Merano between Karpov and Korchnoi. 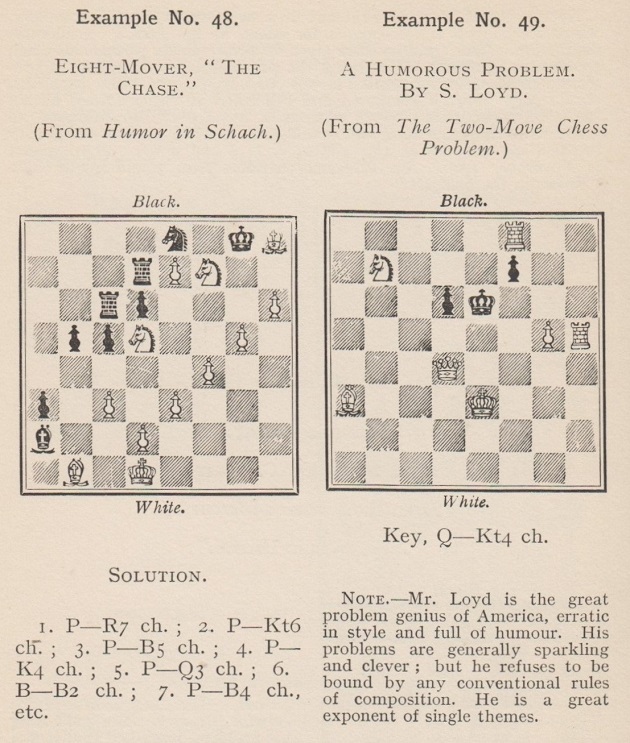 Entitled ‘Gli scacchisti irritabili’ (‘The Irritable Chess Players’), it was included in L’altrui mestiere (Turin, 1985), an anthology of Levi’s writings which has been published in English as Other People’s Trades (London, 1989). 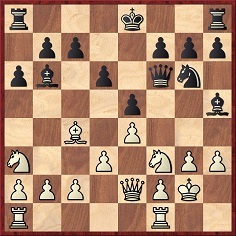 10...Qf6 11 cxb7+ Kb8 12 a4 Qb6 13 Nb5 a6 14 Bxf4 axb5+ 15 axb5 Qxb7 16 Ne5 Ne7 17 Kb3 f6 18 Nd3 Be6+ 19 Kc3 Qe4 20 Be2 Nd5+ 21 Kd2 Qxd4 22 Bf3 Bd6 23 c3 Bxf4+ 24 Kc2 Qc4 25 Nxf4 Nb4+ 26 Kb1 Bf5+ 27 Nd3 Bxd3+ 28 Kc1 Nd5 29 Qd2 Nb6 30 Rd1 Be2 31 Re1 Bxf3 32 gxf3 Rxe1+ 33 Qxe1 Qxb5 34 White resigns. 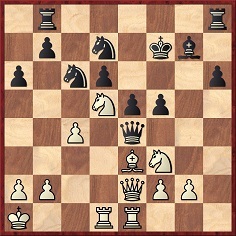 14...Qg5 15 fxe4 Qxe3+ 16 Kh1 Qxd4 17 exf5 Ne5 18 Qb3+ Kh8 19 Nf3 Nxf3 20 Rxf3 b5 21 Rd1 Qe5 22 Rdf1 Rxf5 23 Rxf5 Bxf5 24 Qf7 g6 25 Qb7 Qe8 26 h3 a5 27 Rf3 Rd8 28 Qc7 h5 29 Qxa5 Qe1+ 30 Kh2 Qe5+ 31 Kg1 Drawn. 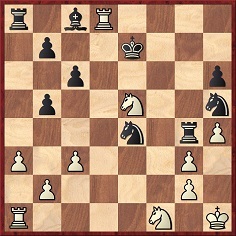 22...f4 23 Nd2 Qg6 24 Bxf4 Nd4 25 Qe4 Nc2+ 26 Kb1 Nxe1 27 Rxe1 exf4 28 Nxf4 Qxe4+ 29 Nxe4 Bf8 30 Ng3 Nf6 31 Re3 Rg8 32 White resigns. 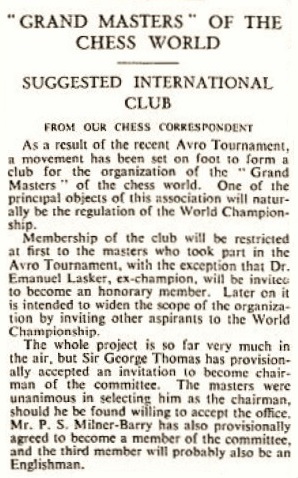 The report was reproduced on page 166 of the February 1939 CHESS. 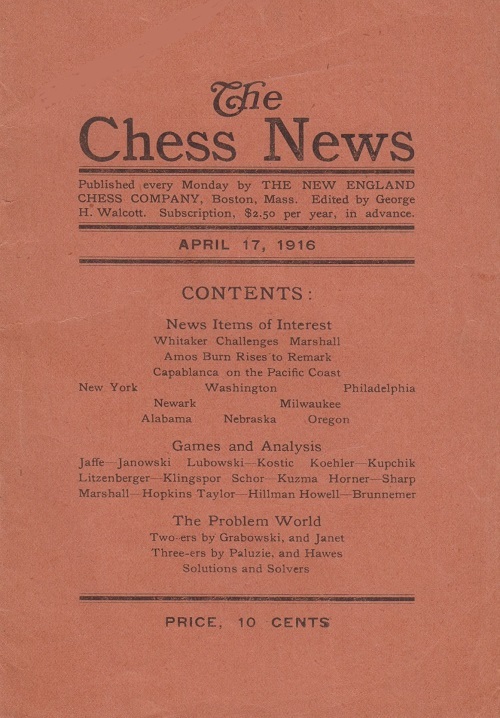 It is still proving impossible to trace the relevant post-17 April 1916 issue(s) of The Chess News. 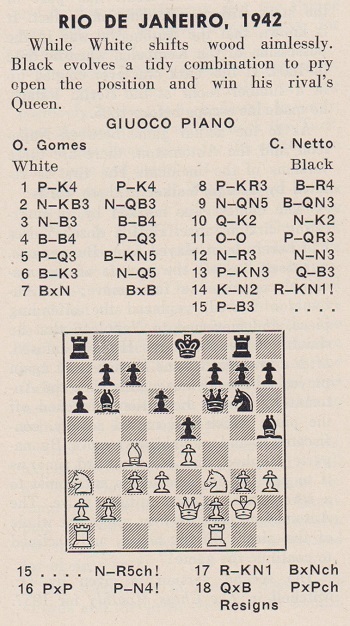 Martino Albonetti (Faenza, Italy) adds that in 1984 Primo Levi wrote two poems which refer to chess. 22 Ncxd5 Nxe3 23 Bxe3 Bxd5 24 Qxd5 Qxd5 25 Bxd5 f5 26 Rxc8 Rxc8 27 Bb3 Rc7 28 Rd2 Nf6 29 Bf4 Re7 30 f3 Nh5 31 Bd6 Rd7 32 Be6 Rd8 33 b3 Bf8 34 Bb4 Bc5+ 35 Kg2 Rxd2 36 Bxd2 and wins. What solid information can be traced about the players and the occasion? We note, though, the spelling Cayetano Netto in reports on other Brazilian activities in the periodical Enroque!! 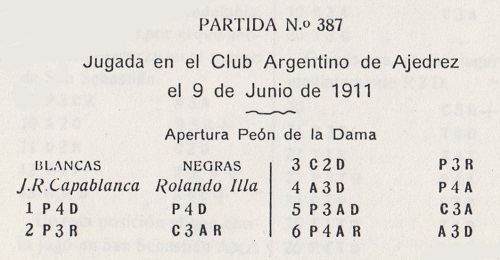 (Necochea, Argentina); see pages 2, 3 and 7 of the 15 February 1942 issue. 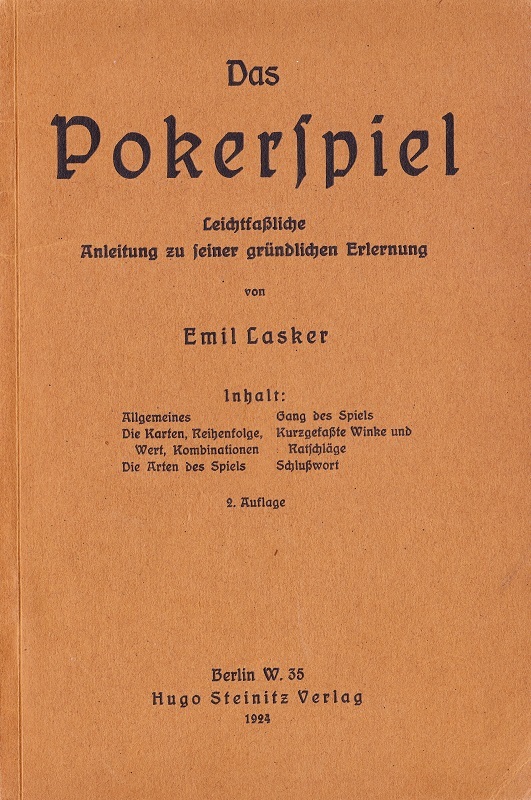 ‘Can any reader shed light on Emil Lasker, the author of a 32-page booklet Das Pokerspiel. Leichtfaßliche Anleitung zu seiner gründlichen Erlernung (an easy introduction to poker)? It was brought out in 1907 by the Berlin publishing house of Hugo Steinitz (1852-1909), with a second edition/printing in 1924. 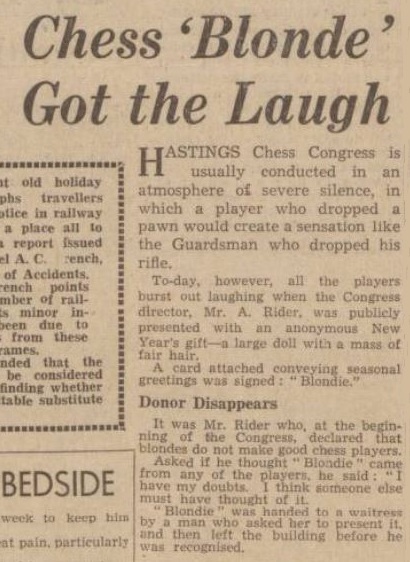 No biographical information on an “Emil Lasker” from that period has been found. Was it a pseudonym? The above illustrations have been provided by our correspondent. An updated and expanded English edition of the German-language monograph on Emanuel Lasker is in preparation as a trilogy, and the first volume is due to be published by Exzelsior Verlag, Berlin in autumn 2018. 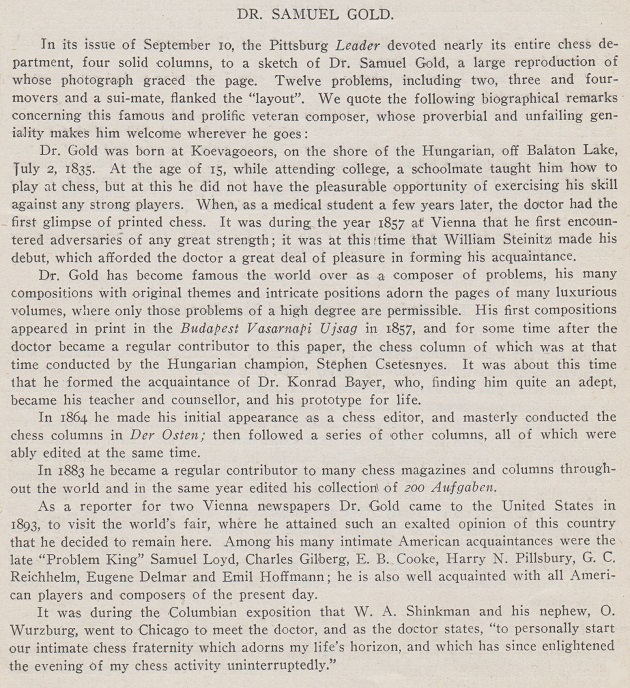 Edited by Richard Forster, Michael Negele and Raj Tischbierek, that volume will focus on the early part of Lasker’s life (childhood; family; visits to the United Kingdom and the United States; his relations with Tarrasch, culminating in the 1908 world championship match) but will also discuss Lasker’s mathematical work and his chess studies and problems. Solvers are invited to note how long they take, and an item will revert to this composition shortly. 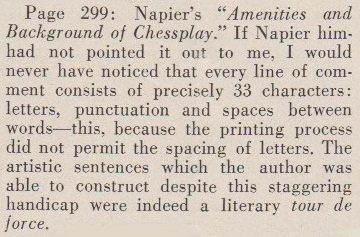 What was the precise wording and context of the remark by Therkatz which Nimzowitsch had in mind? 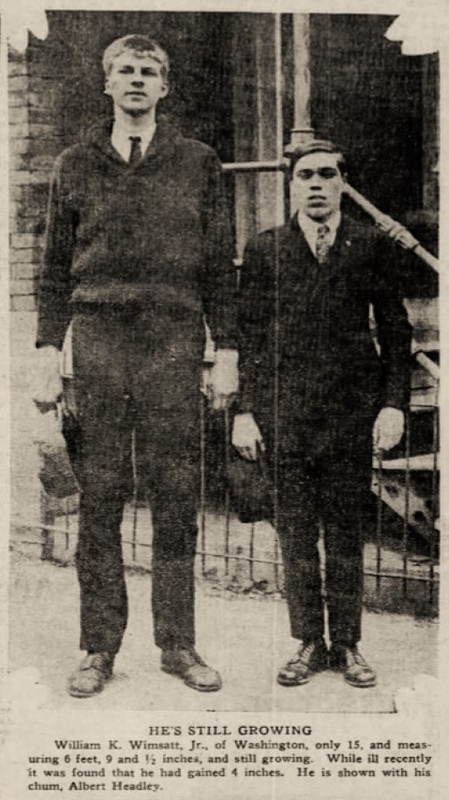 Philadelphia Inquirer, 24 March 1924, page 17. 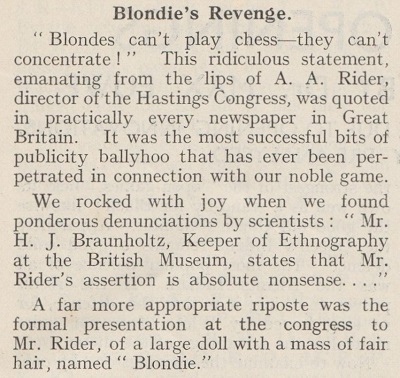 Source: Checkmate, July 1904, page 195. 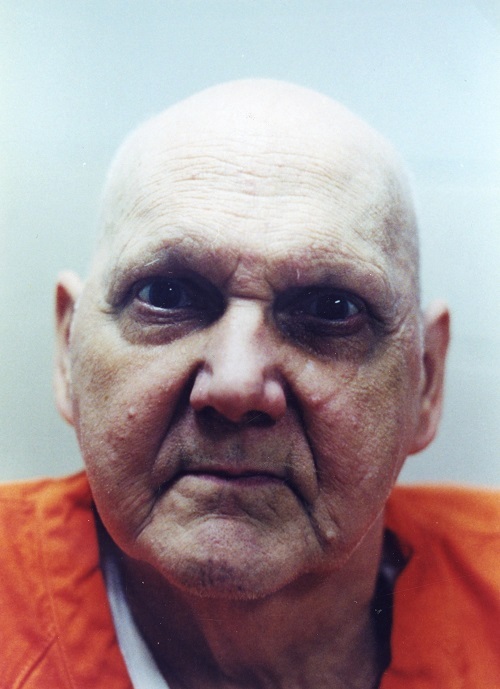 Can a reader supply the Leader column about Samuel Gold? 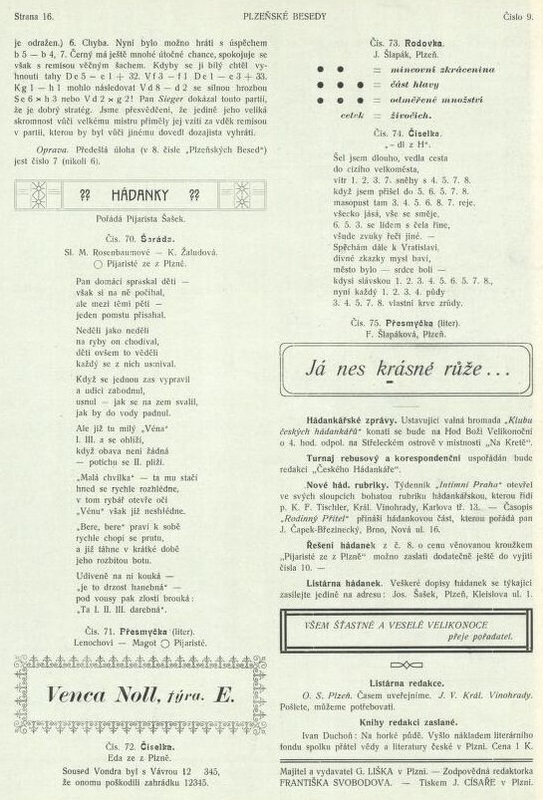 This composition was given in C.N. 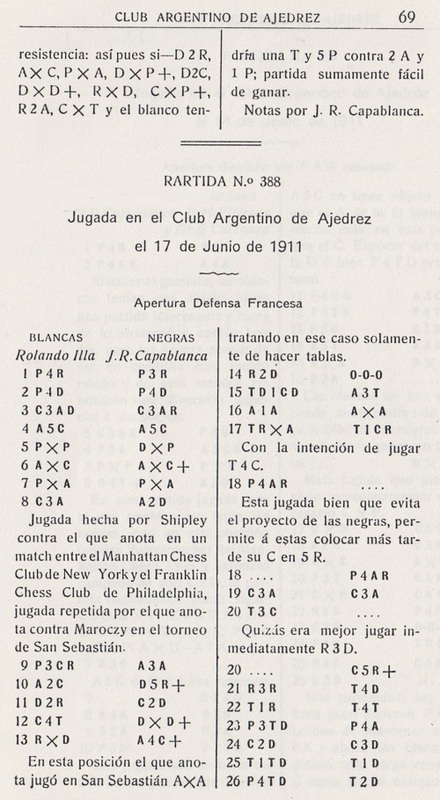 1428 (see page 18 of Chess Explorations), our sources being page 74 of the American Chess Bulletin, March 1927 and page 311 of issue 10 of Les Cahiers de l’Echiquier Français. The latter publication stated that the problem had appeared in Le Monde Illustré when Janowsky had a weekly column there, but no date was given. 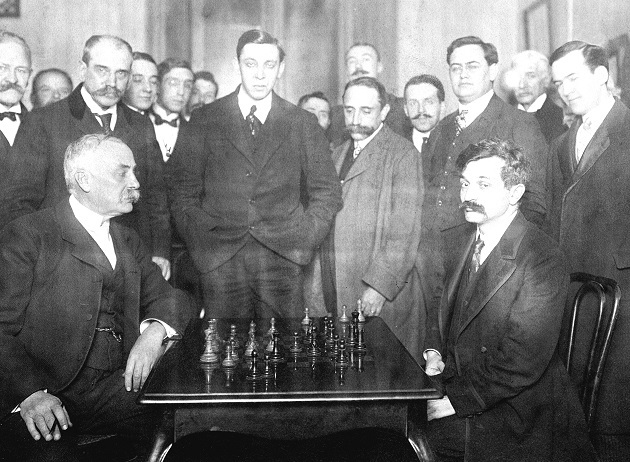 ‘What was the move-order in the third game in the match between Lasker and Janowsky, Paris, 22 October 1909? 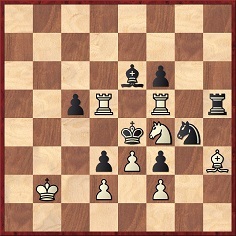 The encounter has been widely discussed in chess literature for its strategic content but seldom, if ever, for the discrepancy over Janowsky’s choice of moves at the critical stage, after Lasker’s famous 20 f5. 20...f6 21 g4 Re7 22 Bf4 Rhe8 23 Re3 Nc6 24 g5 Na5 25 h4 Nc4 26 Re2 Rf7 27 Rg1 Kd7 28 h5 Nd6 29 h6 fxg5 30 Rxg5 g6 31 fxg6 hxg6 32 Rxg6 Ref8 33 Rg7 Rxg7 34 hxg7 Rg8 35 Rg2 Ne8 36 Be5 Ke6 37 Kf4 Kf7 38 Kf5 Resigns. However, this version seems to have become “canonical” only after Tarrasch used it in the 1912 edition of Die Moderne Schachpartie (pages 80-82). 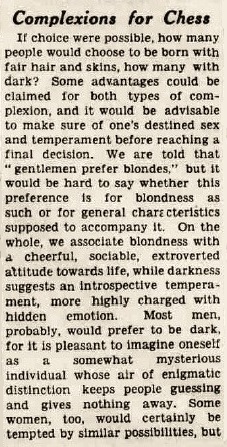 He, in turn, may have relied on the Deutsches Wochenschach, 7 November 1909, pages 391-392 as his source. 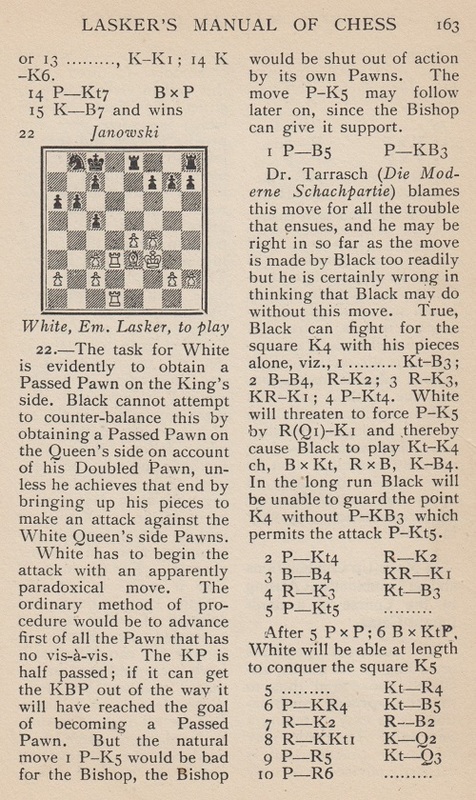 Before adoption by Tarrasch, that move-order was a minority version, although it was the sequence given by Lasker himself in the New York Evening Post, 13 November 1909, page 9. 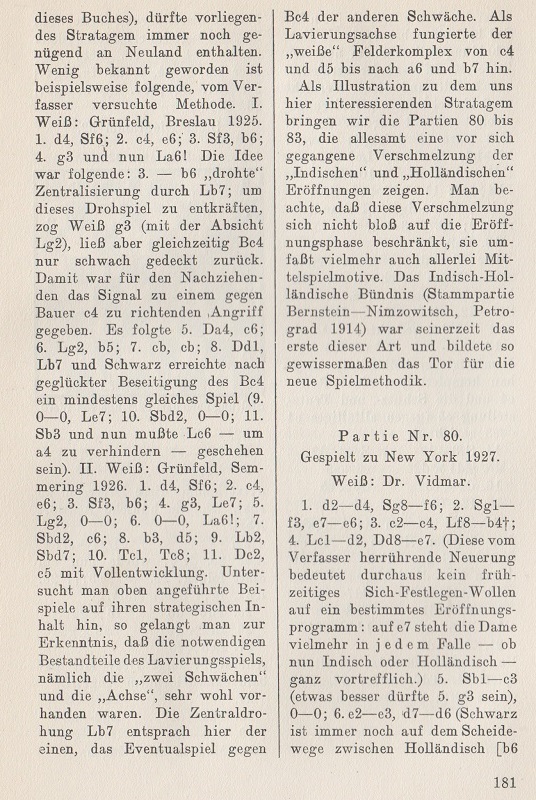 Two publications which followed the Deutsches Wochenschach were La Stratégie, November 1909, pages 392-394, and the Wiener Schachzeitung, January-February 1910, pages 26-30. 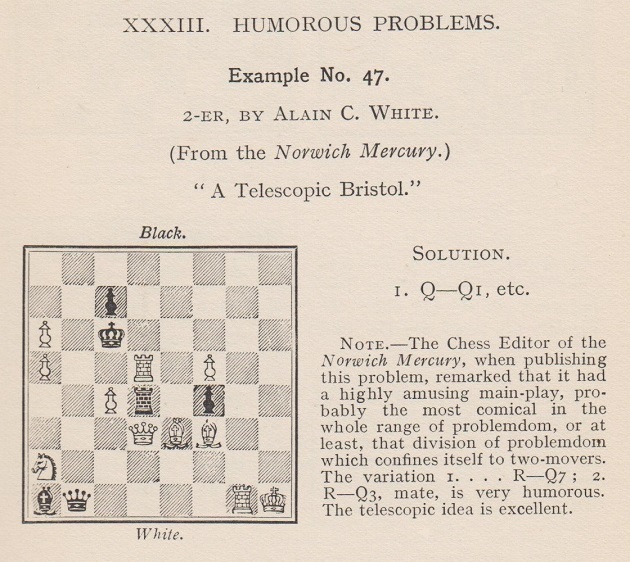 Most other early publications had a different move order: 20...Re7 21 Bf4 Nc6 22 g4 Rhe8 23 Re3 f6 24 g5, and the rest of the game as above. 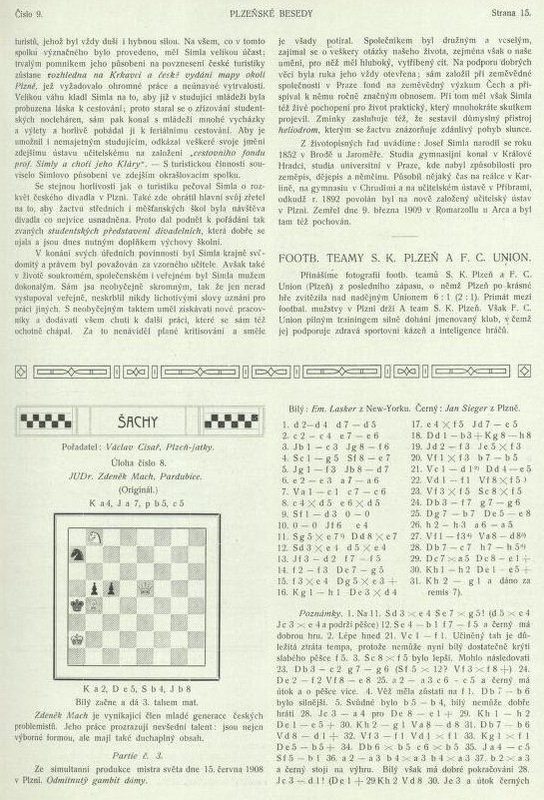 That sequence was given, for instance, by The Field, 30 October 1909; Deutsche Schachzeitung, December 1909, pages 356-357; the BCM, December 1909, pages 553-554, and many daily newspapers. Which version is right? 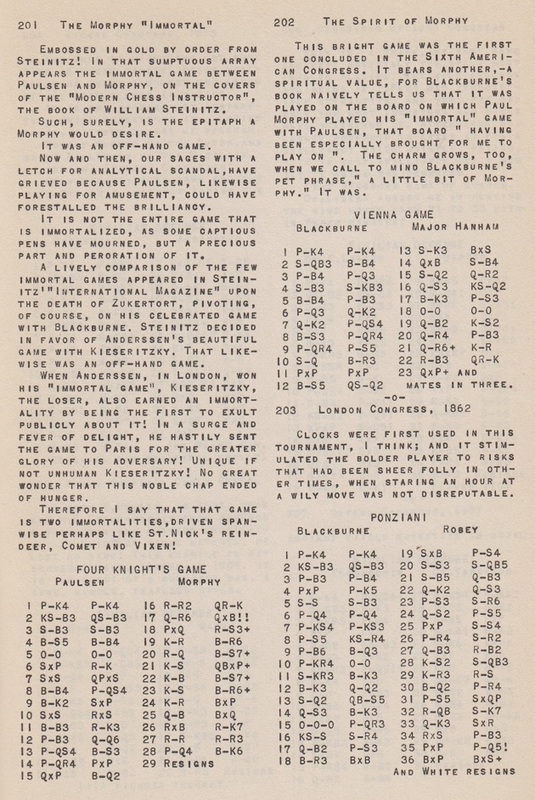 The first has the merit of having been given by Lasker himself, but he may have been writing from memory and mixed up the moves (as happened the following year when he annotated the famous last game in the Schlechter match, giving different opening move-orders in different publications). 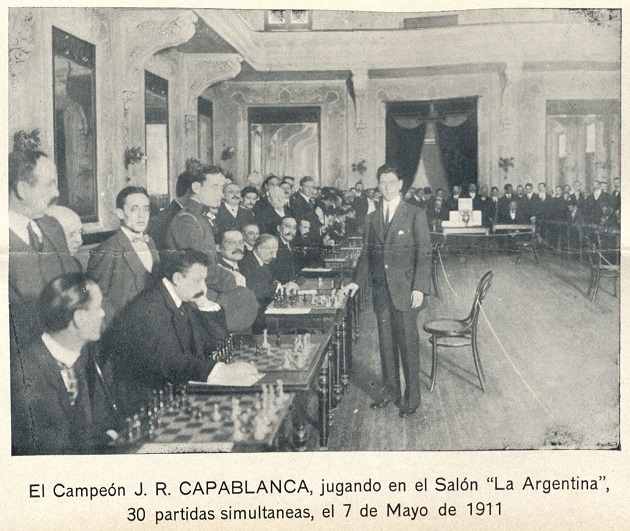 The second has the merit of coming from the Field chess column of Leopold Hoffer, which had stated the previous week, on 23 October 1909, that the match was to be played in the presence of two witnesses and that “The players reserve to themselves the right of disposing of the games, and this right the Field has acquired”. 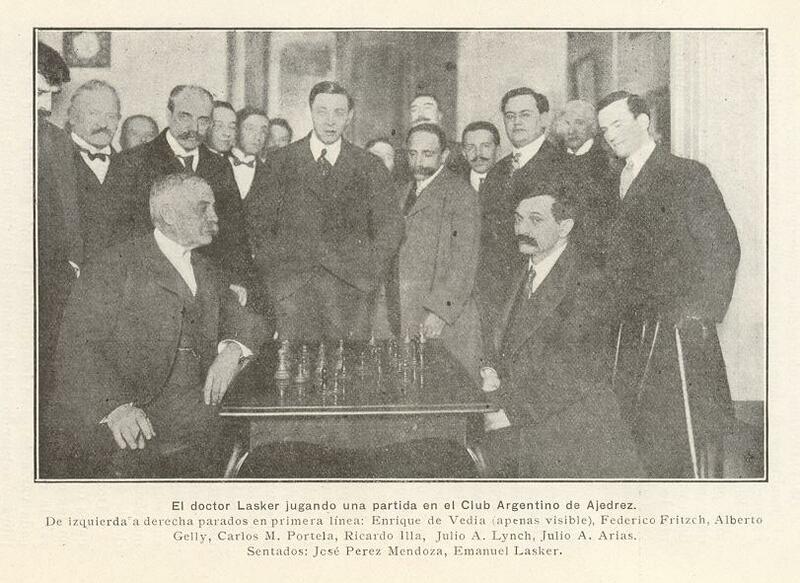 ‘According to page 226 of the Chess Monthly, April 1890, and various other sources, Lasker learned the rules of chess when he was 12 from his elder brother Berthold. As the future world champion was born on 24 December 1868, this must have been around 1881. 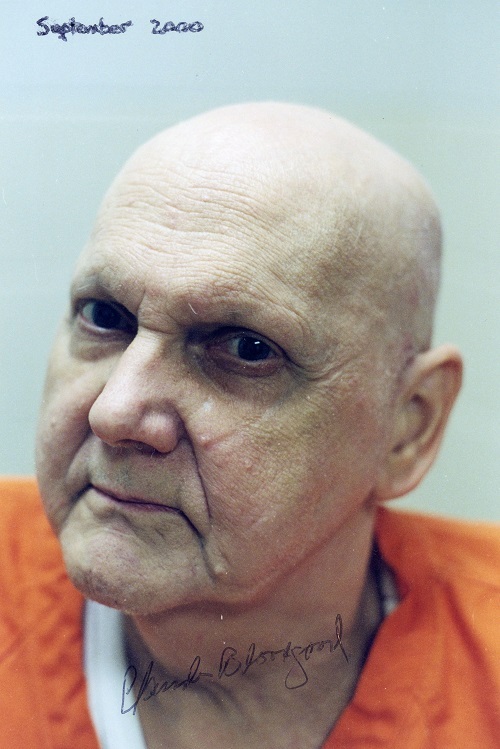 The previous year he had moved from his parents’ home in Berlinchen to live in Berlin with Berthold, who was eight years his senior. 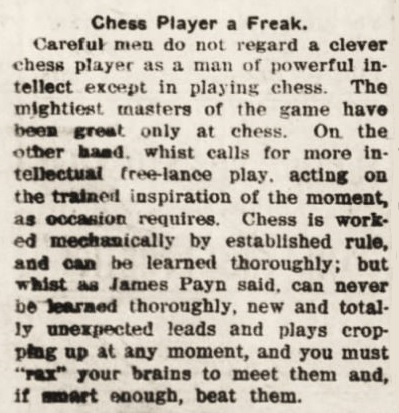 Although fascinated by chess almost immediately, Emanuel stated on several occasions that he really learned how to play chess only a couple of years later, when “for over a year” he did not attend school (Ostrauer Zeitung, 5 January 1929; see also the interview in C.N. 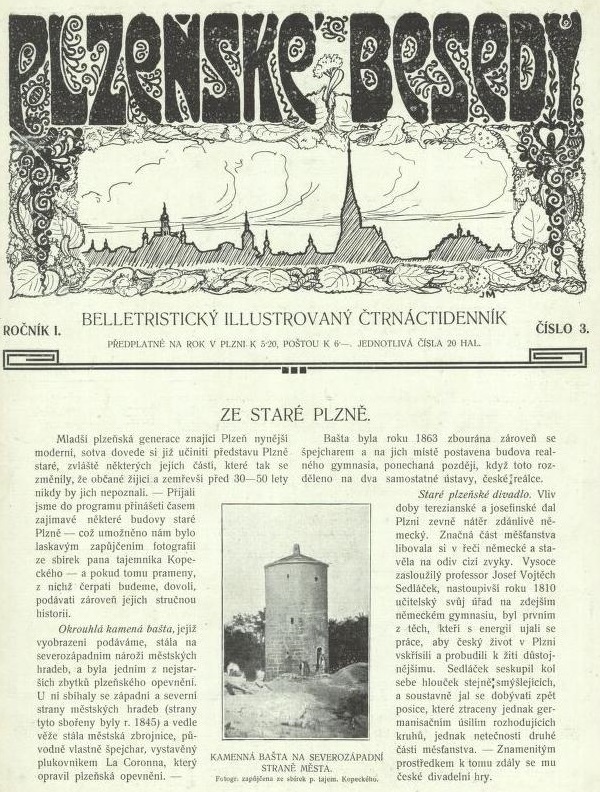 9846). 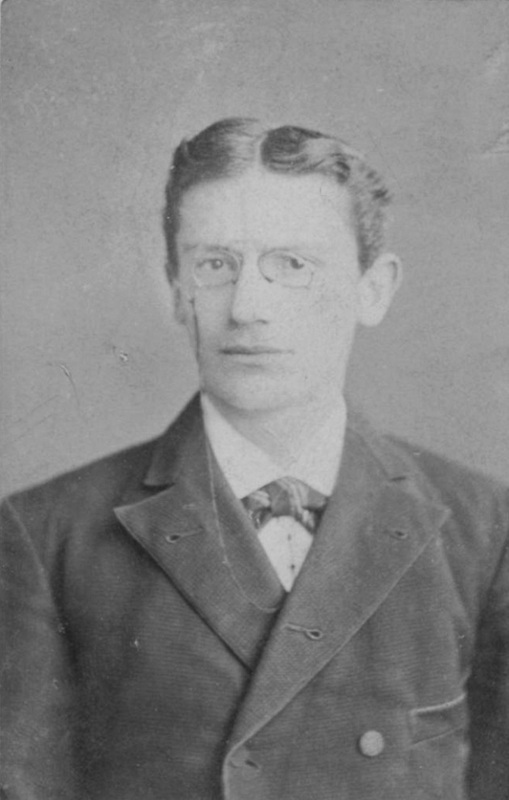 Research and examination of school records indicate that this period of intense chess immersion was in 1885; towards the end of that year his parents removed him from the temptations of chess and made him attend school in Landsberg. 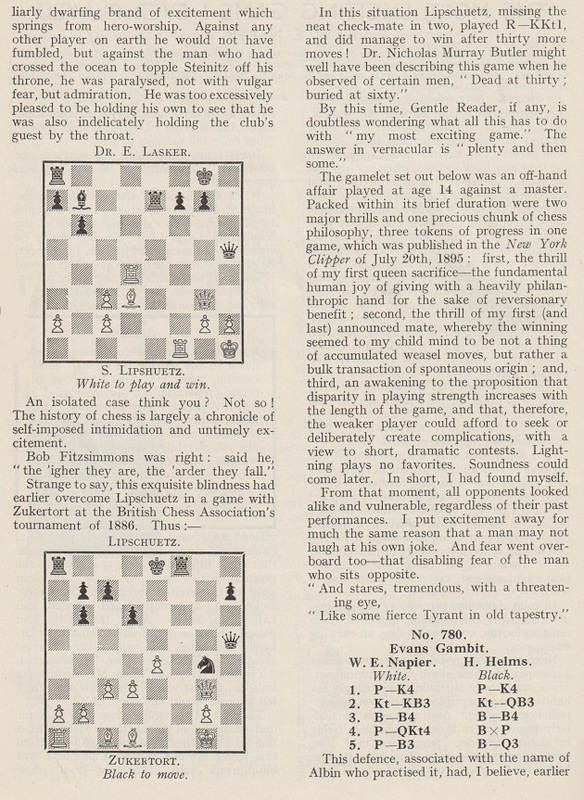 During the early Berlin period, Emanuel met Siegbert Tarrasch for the first time according to Jacques Hannak; see page 16 of Emanuel Lasker Biographie eines Schachweltmeisters (Berlin, 1952). 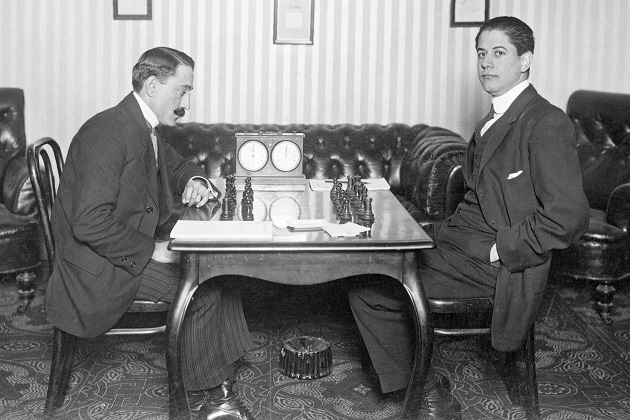 At that time, Berthold Lasker and Tarrasch met regularly over the chess board, and since Emanuel followed his brother’s chess activities closely from very early on, it is indeed highly probable that Tarrasch and the younger Lasker met on such an occasion, although their different levels make it unlikely that they played against each other. 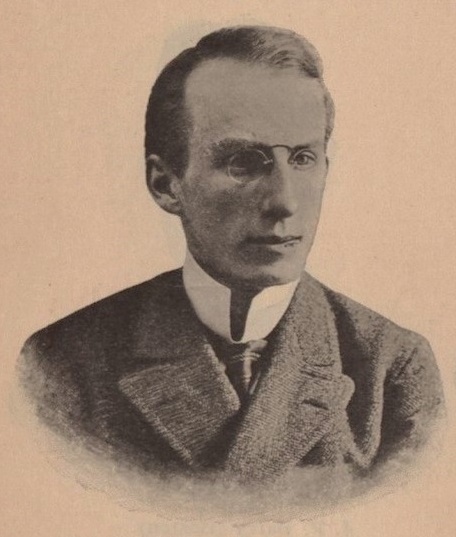 Tarrasch’s biographer Wolfgang Kamm suggests that those first meetings occurred in 1881/82, given that Tarrasch left Berlin in October 1882 to pursue his studies in Halle an der Saale. See page 91 of Siegbert Tarrasch Leben und Werk (Unterhaching, 2004). 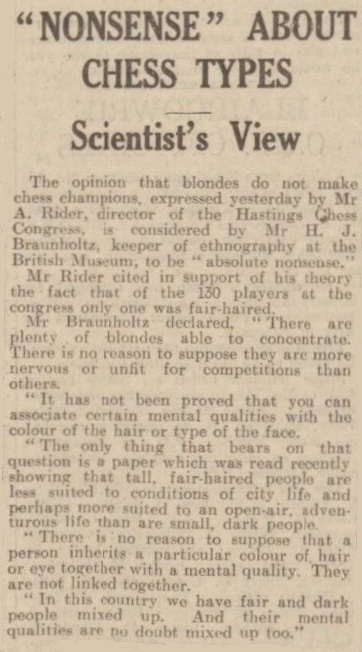 ‘In my research on Emanuel Lasker I have found conflicting data on a move in the fourth game of his match with Tarrasch (Düsseldorf, 24 August 1908). 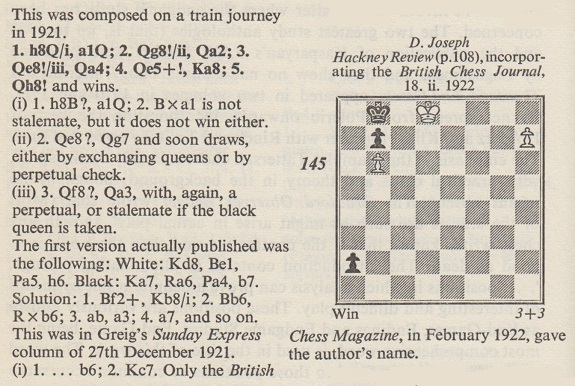 Lasker made his famous rook manoeuvre from e7 via e5 to c5. 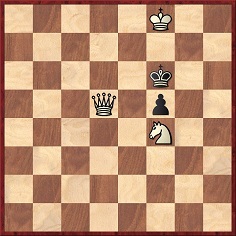 On move 15 did the white queen go from d4 to c3 or from d4 to c4? The above is from the London, 1932 volume. In the original English-language edition (New York, 1927) the text was on pages 182-183. 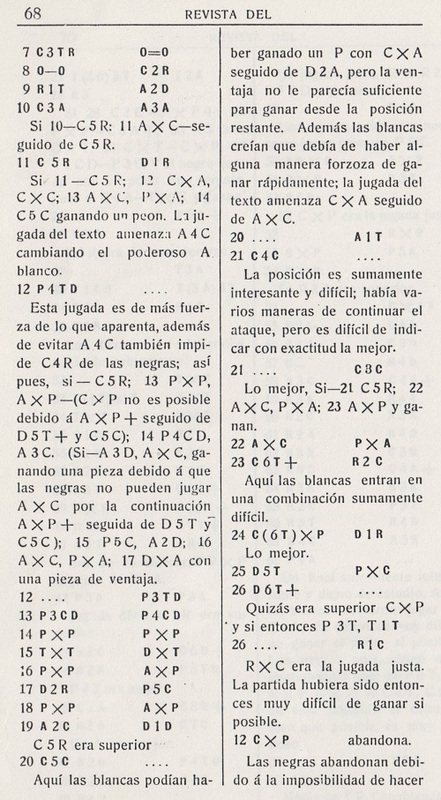 In various 1920s German editions (Lehrbuch des Schachspiels), see pages 142-143 or pages 146-147.